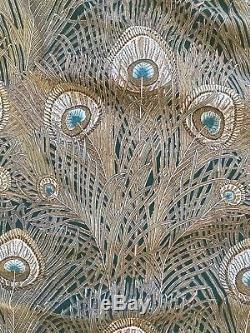 Each curtain measures: Width (along hemline) 185 cm x 253 cm in length. 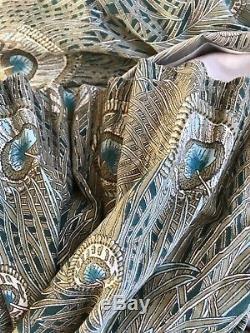 This is a fantastic pair of fully lined curtains in a Heavy cotton blend. 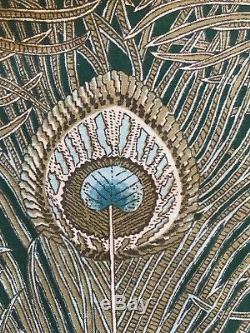 They are by Liberty of London and are In a design called Hera and the colour way is called mermaid. 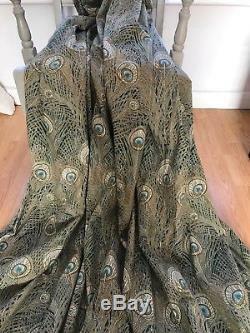 These curtains are a soft blues and greens and have an exquisite peacock feather design. 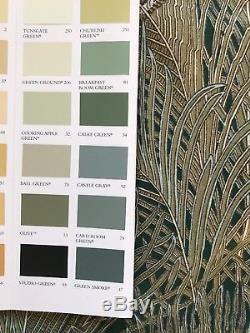 The background colours of the curtains are closest to many of the colours photographed with the curtains on the Farrow and Ball colour chart. 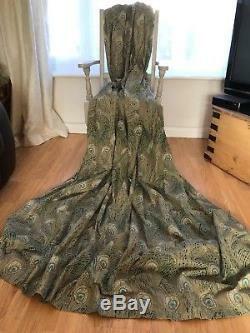 These curtains are in very good vintage condition. 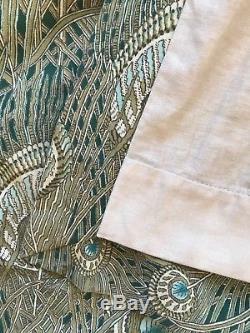 The linings have some sun markings but this is not seen when the curtains are hung. 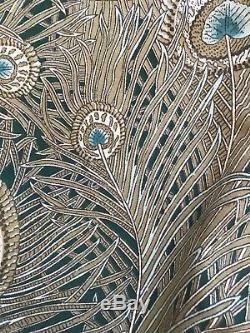 They have pencil pleat header, very attractive and classic. Our ethos is simple: we upcycle, recycle and improve second hand textiles mainly, so that they have a new life. We think this is very green, its hard work but we have great fun doing it. 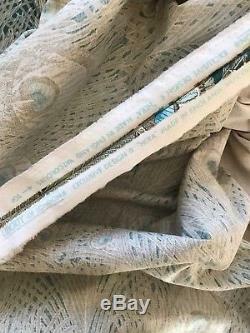 This means our goods are used and may not be perfect so.... All curtains are used unless otherwise stated, and may show some signs of wear. There may be slight fading particularly along the outer edges due to sun damage during normal use. This is an assurance of standard and quality. Any significant defects will be photographed and mentioned specifically on the listing. However, sometimes a defect can be missed, we are human after all and in this event, we welcome the opportunity to put things right, so please get in touch! Occasionally small sympathetic repairs are carried out prior to sale as pre loved can sometimes mean that there is wear and tear. We treat you, our buyers, as fairly as we expect to be treated ourselves, and our customer service is excellent. We are grateful for your consideration. 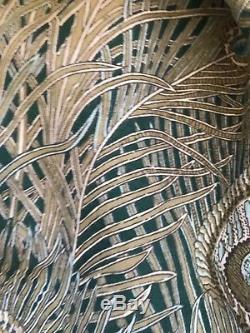 LIBERTY OF LONDON HERA IN MERMAID HUGE EXTRA LONG VINTAGE CURTAINS" is in sale since Sunday, November 11, 2018. 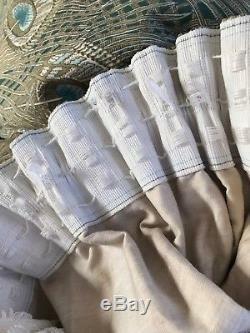 This item is in the category "Home, Furniture & DIY\Curtains & Blinds\Curtains & Pelmets". 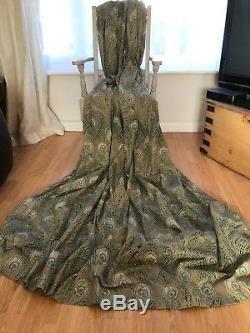 The seller is "thecurtainconsultancytoo" and is located in Bristol. This item can be shipped to United Kingdom, Austria, Belgium, Bulgaria, Croatia, Cyprus, Czech republic, Denmark, Estonia, Finland, France, Germany, Greece, Hungary, Ireland, Italy, Latvia, Lithuania, Luxembourg, Malta, Netherlands, Poland, Portugal, Romania, Slovakia, Slovenia, Spain, Sweden, Australia, United States, Canada, Brazil, Japan, New Zealand, China, Israel, Hong Kong, Norway, Indonesia, Malaysia, Mexico, Singapore, South Korea, Switzerland, Taiwan, Thailand.